IF YOU WOULD LIKE US TO DELIVER PLEASE FIRST CHECK OUR DELIVERY AREA THEN TICK THE DELIVERY BOX WHEN YOU ADD TO CART. Always call us for the best price! Vigorously supports combustion. Introducing oxygen to conventional air-fuel flames increases the temperature of the flame. Used as an ingredient in some shielding gas mixtures, due to its ability to help stabilise the arc and reduce surface tension. Widely used with a fuel gas for cutting, welding, brazing and soldering. 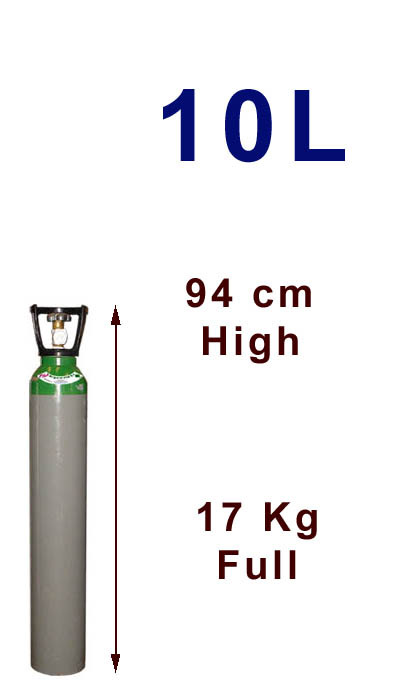 The use of oxygen gives higher flame temperatures than if air is used. In oxy-cutting, an oxy-fuel flame preheats the steel to its ignition temperature. A jet of gaseous oxygen flows onto the red-hot steel, generating more heat and melting the steel. The steel in contact with the oxygen jet is oxidised, creating metallic slag which is blown from the cut, allowing more steel to react with the oxygen. In plasma and laser-cutting steel, an arc or laser beam is used to heat the steel to its ignition temperature. Oxygen is then used in the same way as with oxygen-cutting to create an exothermic reaction and to blow away any metal oxide or slag. Thermal lancing oxygen is used in conjunction with the steel lance to create a high-temperature melting process capable of drilling or cutting through materials such as concrete, brick, stone and most metals. High-purity oxygen is used in the laboratories, process-control operations, metal analysis instruments and in semi-conductor production. Used as an assist gas in lasers for cutting mild steel. Oxygen vigorously supports combustion of many materials, which will not normally burn in air. Copper, brass and high quality stainless steel are the most commonly used metals and are compatible with oxygen. However most lubricants are not compatible; oil and grease can ignite spontaneously burning with explosive violence and should not be used with oxygen. Oxygen must never be used with Polytetraflouroethylene (PTFE) tape, as it will cause combustion.